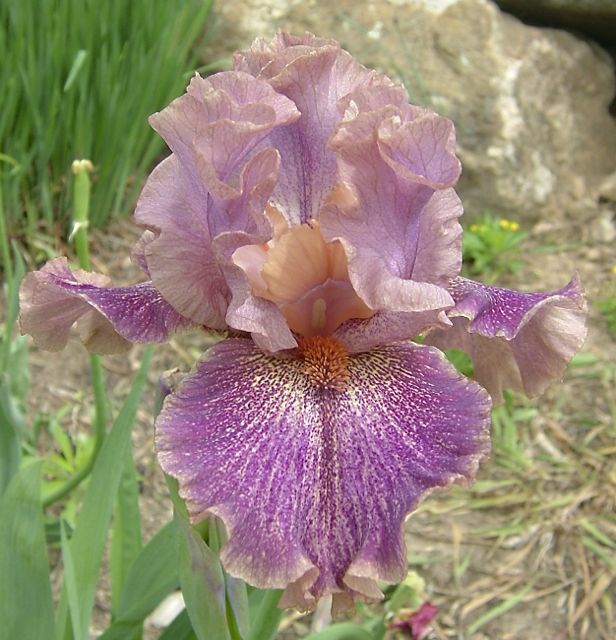 'Scrivener' (Marky Smith, R. 2010) Seedling #05-26B. IB, 26" (66 cm), Late midseason bloom. Standards smoked old lilac (near RHS 88C), tan edges; style arms old lilac, smoked salmon-tan edges; Falls light salmon ground heavily washed prune violet (greyer than 83D), pale salmon veins; beards smoked spice-orange (171A); luminata plicata pattern; slight sweet fragrance. Sibling to 'Italics'. Salmon Creek 2011. Honorable Mention 2015.
jpg BHP_8981-X2_scrivener.jpg manage 228 K 12 Feb 2016 - 08:31 BrockHeilman Please contact Brock Heilman for image use.